You've heard of wearing your heart on your sleeve, how about wearing your passion on your shirt? I'm speaking of the passion of the bacon. That delicious sizzling salty smoky scented salivation inducing Bacon. Wear it loud and be proud! Bacon enthusiasts everywhere will know you're on the team with these bacon slogan t-shirts. Our bacon clothes make great conversation starters. All bacon t-shirts are tag-less and made from 100% cotton. Bacon hoodies and caps are available, as well as an apron emblazoned with pig pride. A word of caution for the ladies, however, for our "got bacon?" t-shirt with the scratch and sniff bacon slice on the front. Like bacon, this t-shirt is known to attract the attention of others. 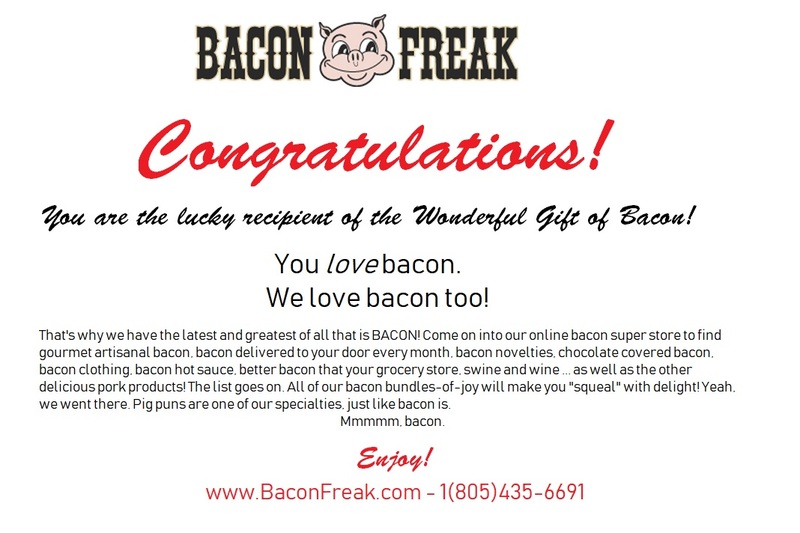 Get your Bacon Freak on with a Bacon Freak hooded sweatshirt. Bundle up in this cozy hoodie that let's everyone know that you're a bona fide bacon freak. Pick your hoodie size. Made with 50% Preshrunk Cotton / 50% Polyester. Get your Bacon Freak on with a Bacon Freak long-sleeve shirt. Bundle up and let everyone know that you're a bona fide bacon freak with this awesome shirt. Pick your long-sleeve shirt size. 100% Cotton. Get your Bacon Freak on with a Bacon Freak t-shirt. Let everyone know that you're a bona fide bacon freak with this awesome t-shirt. Pick your T-shirt size. 100% Cotton.